SB: “This model was initially developed by colleagues from Stanford University. 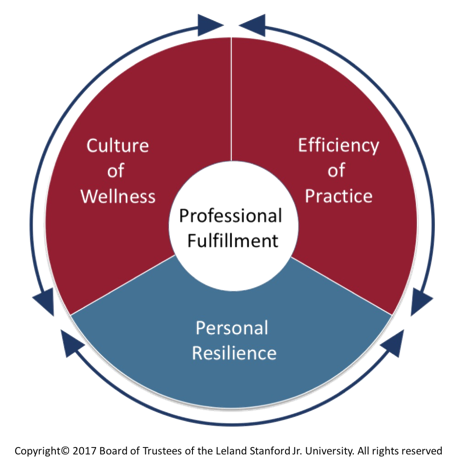 There are three domains: efficiency of practice, a culture of wellness, and personal resilience. Each domain has equal weight, as do the interactions and reciprocity between them. Professional fulfillment is at the center of the model. While professional fulfillment is important for all members of the health care team, this work focuses on the physician. enhancing individual and unit-level resilience. 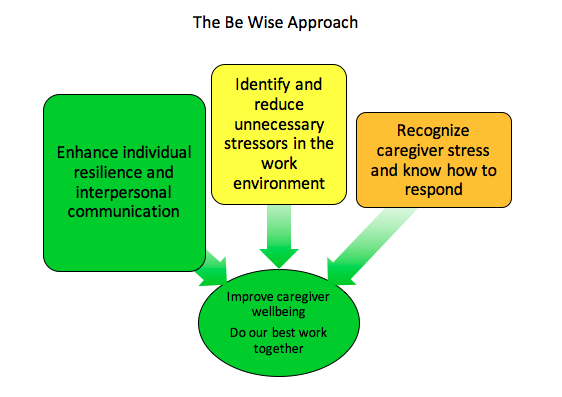 So, the approach that we are taking at UVA is congruent with the Stanford approach, and with the growing body of evidence that suggests that this combination of dealing with organizational or systems factors that increase stress unnecessarily, enhancing individual resilience factors, and fostering a culture that is compassionate and respectful of our caregivers. SB: “The ambulatory optimization programs are welcomed and are a good example of the reciprocity and balanced approach of the model. Efficiency of practice in this model is defined as the value-added clinical work accomplished divided by time and energy spent. One way to tell how things are going is to do a simple equation of expected versus actual – the amount of time needed to do something versus the actual time afforded. Factors that contribute to physicians’ efficiency of practice include workplace systems, processes and practices that help physicians and their teams to provide compassionate, evidence-based care for their patients. Excessive time pressures and chaotic work environments impair patient care. The envisioned practice assessments, team approaches and system improvements all contribute to efficiency of practice directly and support a culture of wellness. Similarly, these efforts can decrease physician stress, enhance joy in practice, contribute to positive learning and care environments, and support recruitment and retention of physicians at UVA. SB: “There are a number of things that can help to optimize high quality care: Re-engineering and continuously improving care processes and clinical work flows, optimizing EMRs, providing adequate staffing in both numbers and levels of training (allowing everyone to work at the top of their license & spend more time doing work for which they are uniquely trained), mitigating regulatory and documentation burdens and maximizing user-friendly decision support and facilitating reliable care coordination. I suggest considering elements for success in clinical practice to include 5 ‘T’s’: Time for direct and related care, Team composition and function, Technology including EMR tools and training, Top of the License roles for all team members & Temperament for resilience, change and engagement with all stakeholders. These elements can be addressed individually and collectively as the ambulatory optimization project proceeds. CMO: Thank you for describing this model. Our ambulatory optimization plans are moving forward, and you’ll be hearing more about this in the coming months. * Burnout is defined as a triad of emotional exhaustion, interpersonal disengagement, and a low sense of personal accomplishment which impacts optimal care. Reference: Bohman B, Dyrbye L, Sinsky CA, Linzer M, Olson K, Babbott S, Murphy ML, Purpur deVries P, Hamidi MS, Trockel M. Physician Well-Being: The Reciprocity of Practical Efficiency, Culture of Wellness and Personal Resilience. In New England Journal of Medicine, Catalyst. April 2017.